Historical Archaeologist Pat Tucker chanced upon the court case of Jean-Baptiste Beaugrand while researching another case connected to French Canadian history. This research culminated in an article for Michigan’s Habitant Heritage (Jan 2006) on territorial court records as a source for French-Canadian history, culture, and genealogy. The trial of Beaugrand and its connection to the legend of Sans Souci brings to light the extent to which folklore was integrated into the French-Canadian culture of early Michigan…and resulted in a surprising verdict in a murder case. 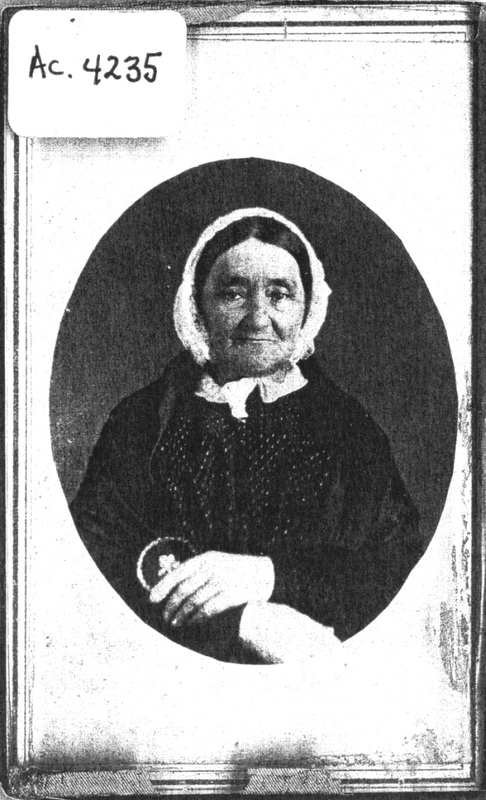 Marguerite (Chabert) Beaugrand (1782-1859), wife of Jean-Baptiste Beaugrand. Courtesy of Nan Card, Curator of Manuscripts, The Rutherford B. Hayes Presidential Center, Fremont, Ohio. Jean-Baptiste Beaugrand, a former major in the Michigan Militia and partner in the firm of Godfroy & Beaugrand of Detroit, sat in Detroit’s jail in August of 1814. He was awaiting trial for the murder of a Kentucky volunteer during the War of 1812. Beaugrand must have been searching his soul for how he became involved in such a predicament. It could not only cost him his honor and respect within the French community of Detroit, but also his life if found guilty. Many things might have come to mind: Perhaps Beaugrand recalled being caught in the middle of British-American-Indian hostilities when his store at the Maumee River rapids was destroyed during the Battle of Fallen Timbers in 1794. Or when history repeated itself eighteen years later in 1812 when his store was looted by a detachment of British and Indians. And certainly, he thought about all the destruction on the River Raisin wrought by the British and Indians in the massacre at Frenchtown in 1813. But the incident Beaugrand no doubt concerned himself with the most was the one he was in jail for. Beaugrand was home at his farm on the River Rouge in August 1814 when a detachment of American volunteers, commanded by Lt. James Whitaker, arrived and confronted him. Whitaker was led to Beaugrand’s farm by Pvt. William Atherton. Atherton told Whitaker that the old Frenchman was the one who killed a certain Pvt. James Ebenezer Blythe at Stony Creek, a few miles away, on January 23, 1813. Beaugrand was immediately apprehended and taken to the authorities in Detroit. Beaugrand was brought to trial in the house of John Kinzie on October 14, 1814 where he pleaded not guilty to the charge of murder. Five days later George Meldrum, George McDougall, François LaFontaine, and François Navarre were called as witnesses to tell the jury all they knew regarding the incident. Atherton was the only witness for the prosecution. Atherton told the jury that a group of Indians holding several Kentucky captives, including the unfortunate Blythe, arrived at Stony Creek about 2 p.m. on January 23, a few miles northeast of the River Raisin. Beaugrand and some wounded Kentucky soldiers were already there waiting to be transported to Fort Malden in Canada. The Indians made a large fire and gave the Americans some bread to eat. As they ate, one of the Indians walked up to Blythe, struck him in the head with a tomahawk, and after falling to the ground struck him two or three more times. Then, an “old Frenchman,” unknown to Atherton, took the weapon from the Indian’s hand and struck the final blow killing Blythe. The American prisoners were stunned by what they observed, and quickly lost their appetite for the bread. The prisoners were separated into smaller groups and the Indians took them by different routes to Detroit and Sandwich. The group taken to Detroit stopped at a farm on River Rouge, where Atherton observed the same “old Frenchman” jovially conversing and smoking with one of the Indian escorts. Atherton made sure to remember the location of the farm to avenge Blythe’s murder. And now, at trial, Atherton identified Beaugrand as the “old Frenchman” who had struck the fatal blow. During the trial, tempers flared between the French Catholics of Detroit and Kentuckians. But the jury, mostly old Detroit French habitants, rendered a verdict that Beaugrand was guilty of murder. Their statement read that Beaugrand “…did willfully, with pre-meditated malice, assault an individual, unknown to the jury, on the head with a tomahawk … which caused the death of the individual.” However, the jury stated further that Beaugrand was “moved and seduced by the instigation of the Devil” in committing the act. Though Beaugrand was guilty of murder, they acquitted him by reason of being possessed by the Devil! This has to be one of the strangest verdicts of a grand jury in American jurisprudence. The trial testimony gives no reason why the jury invoked Satan to acquit Beaugrand. They were either looking for a technicality so they could acquit their fellow Frenchman of responsibility, or they truly believed Beaugrand was in league with the Devil and was to be feared by all! Did the Devil really make Beaugrand do it? We can look to the folklore of French Detroit to find the answer. The folktale of Sans Souci originates around the time of the Detroit fire in 1805. With its mix of fact and fiction, Sans Souci was known to French Detroiters long before the Beaugrand trial. The story goes that French traders and Indians, like Tecumseh, Black Hoof, Walk-in-the-Water, and Okemos, a nephew of Pontiac, liked to socialize at Gabriel Godfroy’s house Detroit during long winter evenings. Wild tales would be told around a crackling fire. One night the men were talking about Sans Souci, the old mare owned by Godfroy’s store clerk – Jean-Baptiste Beaugrand. San Souci would regularly visit the cornfields and melon patches of Godfroy’s neighbors to have a nibble. When discovered, she would escape in a wild gallop through a gauntlet of musket blasts, sticks and stones, and whips wielded by angry farmers. On her way out Sans Souci would respond by kicking up her heels, scowling, and saluting them by swishing her tail. Godfroy and his guests had finished a jug of cider and Okemos asked for more to drink. So, Godfroy and his guests went looking for Beaugrand to supply them with more provisions when they saw a light in Godfroy’s barn. Peering through the chinks in the barn’s walls, they saw Beaugrand and Sans Souci sitting at a table playing cards. As they played, they poured a liquid that looked like melted brass into a cup and drank it. Alarmed, Godfroy kicked the barn door open and Sans Souci leapt out the window. The group accused Beaugrand of witchcraft, but Beaugrand scoffed and insisted he was only brewing a little cider on the coals in his loft. He said that his mare would be found asleep in the stable below. A strange explanation indeed, given what they had seen! A few weeks later Detroit was destroyed by fire. Godfroy’s barn contained the charred remains of Sans Souci, Beaugrand’s old mare, although many thought she had been carried off by the Devil in a cloud of smoke. Others claimed they saw the sinister Nain Rouge laughing on the roof of the barn just before it collapsed. It was said that after the massacre at the River Raisin, Okemos and his Ojibwe followers were persuaded to join the American cause by Godfroy. They thought Godfroy must be a man of “big medicine” due to his association with Beaugrand! The Detroit jury may have seen Beaugrand as a scapegoat and resented hearing the Kentuckians call one of their own a murderer. Invoking the Devil may have been a legitimate way to acquit Beaugrand. On the other hand, the jury, mostly devout, yet superstitious Catholic French Canadians may well have feared Beaugrand was truly involved with the Devil, just as Okemos did, and thought better of taking a chance on sending him to the scaffold.